Abies koreana 'Gelbbunt' has yellow branches which appear irregularly on this otherwise dark green Korean fir whose conical shape and variegated coloration give this unique, slow-growing conifer a distinctive look. First introduced by Gunter Horstmann in Germany in 1978. There is some confusion among taxonomists about this plant. Sometimes the name 'Variegata' is appended and many believe that that could predate 'Gelbbunt.' The RHS opines that they are different cultivars with 'Gelbbunt' having pure yellow twiglets while the 'Variegata' may not. 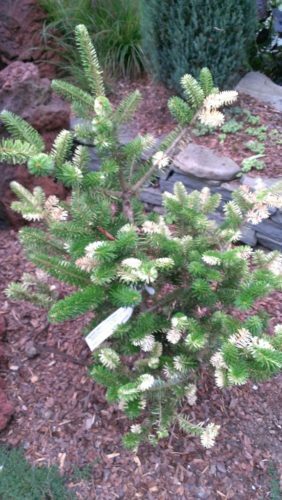 A Gelbbunt Korean fir in Jerry Kral's garden, Rochester, NY.